Heart rate training can be a vital tool for cyclists. It can help you get stronger, faster and fitter – all while preventing overtraining and burnout. But that’s only if you know what to look for, how to find it and how to track it. However, before you start tracking your heart rate, it’s important to understand what exactly goes into this type of training. Your heart rate is the number of times your heart beats per minute as it pumps blood through your system. It’s your body’s response to the work you’re doing, so the harder your ride, the higher your heart rate. Two of the most important numbers in heart rate training are your resting heart rate (the number of beats per minute while resting) and your maximum heart rate (the highest number your heart contracts in one minute). This figure serves as a baseline for your overall health and fitness levels: as your fitness increases, your resting heart rate decreases. Your body becomes more efficient and less effort is needed to pump blood through your system. If you have a heart rate monitor, simply put it on and lie down for a few minutes, staying as relaxed as possible. Note the lowest number you see, and repeat the next day. If you don’t have a HR monitor, find your pulse – either on the inside of your wrist or on your neck – and count the number of beats you feel for one minute (or for 30 seconds and multiply by 2). At the end of the week, average the seven numbers together and that’s your resting heart rate. While you can go to a doctor and take a stress test to get your max HR, an easier way is by using our Wahoo RunFit App. This free app takes you through a simple test designed by a heart rate expert to calculate all of your heart rate zones. By knowing your max HR, you’ll be able to determine how hard (or easy) each of your workouts should be. If you don’t have our app, the method below is another option. All you need is your bike and a long, steady hill. 1. Start off at a quick pace, increasing your speed every minute. 2. For about five minutes, stay seated. 3. When you can’t go any faster while sitting, get out of the saddle and sprint as hard as you can for 15 seconds. 4. Immediately take your heart rate and you’ll have your max heart rate. 5. Curse yourself for not downloading the Wahoo Fitness App, which could have made it all easier. While we’re on the topic of max HRs, it’s interesting to note the number can vary from sport to sport. For example, your running max HR is likely higher than your cycling max HR. That’s because max HR is dependent on the size of muscle groups used, and running uses the largest muscle groups in the body. As a result, it’s crucial you determine your max HR individually for all of your athletic activities. 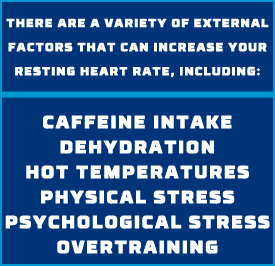 Now that you know your resting and max heart rates, you can use these numbers in your cycling training. There are five different heart rate training zones. We’ll start with the lowest and work our way up. Active recovery workouts help you recover from hard efforts by flushing out lactic acid from the body. These workouts help with fatigue and soreness – but only if you make sure to keep them easy. Otherwise, you won’t get the benefits, and instead, you’ll risk overtraining. This is also the heart rate you want for the “recovery” part of your cycling intervals. This should be the foundation of your training and make up the bulk of your workouts – especially if you’re a beginner cyclist. It’s where you build your base and burn fat, and it’s an intensity you should be able to comfortably hold for an extended period of time – all while chatting and enjoying the scenery. Your long rides should be at this intensity. You’re working harder than active recovery; but not so hard that it’s uncomfortable. This type of training improves aerobic fitness, power, strength and blood circulation, and it’s often mixed in with Zone 2 training. The best way to describe it is “comfortably hard”. You’re working, and you feel it. But you can keep pushing through. Also known as anaerobic threshold, this type of training increases maximum performance capacity, enhances lung capacity and improves high-speed endurance. That said, this type of training is very challenging – it’s not an effort that can be sustained for long – so it’s best used in interval training with periods of active recovery. This is one of the most intense types of training, and it’s an effort you can sustain for maybe 3 to 8 minutes at a time. Your legs will burn as you push your bike forward, and you’ll be gasping for air. While very intense, this type of ride helps train your heart to quickly bring blood where it’s needed in your body, making you a more efficient rider and racer. While the old school way of taking two fingers to your wrist or neck does to determine your heart rate gets the job done, it can be difficult to derive an exact number in the midst of a workout – especially for cyclists. If you are cycling, removing one hand to feel for a pulse can be a little dangerous, to say the least. After all, you run the risk of cycling into a pedestrian, tree or car. None of those are very appealing options. That’s where Wahoo’s TICKR X comes into play. Our heart rate monitors can help you adjust your effort so your heart rate falls within a specific zone in real time. You don’t have to remove your focus from your workout. That makes tracking your heart rate easier and your workout more efficient. In addition, combining our TICKR X with our GPS bike computer, ELEMNT, allows you to easily view your heart rate – letting you adjust as needed and stay on target. The ELEMNT displays all of the stats you need during your ride, including speed, distance, ride time and a handy clock. You can also link both of these devices various apps to help you analyze your cycling data. By tracking your heart rate in your cycling workouts, you’ll become a more efficient rider and athlete. You’ll know when to push harder and when to cut back, and you’ll become better attuned with your body. Is there a way to view the zones after the ride is stored? I can view the zones on my RFLKT as I ride, but have never been able to view them after the ride is saved. It would be nice if that was added or available. I still don’t get how this voodoo works but this chest strap accurately displays my cadence. It’s voodoo. It’s magic !! Great advice! Any quick thoughts on a few exercises or programs that would be good for each of those zones? For example, 30 seconds of burpees would get you into which zone? Or 15 seconds 100% sprint a spin bike? Carmichael Training Systems has some great plans for training with HR as well as Training Peaks. I think the 15minutes might be a typo. On the Wahoo Elemnt Bolt, the HR zone display is one number. Is it possible, or is there a plan to display it with a decimal point or big number small number to know where within each zone you are or how close you are to the next zone ie. 3.2 – low zone 3; 3.7 high zone; 3.9 border line zone 4? not currently but worth considering. Thanks!